We are one of the leading Manufacturers & Suppliers of a comprehensive assortment of Agitators. Designed and fabricated using the latest CAD/ CAM technologies and premium raw materials, our entire range of Agitators is reliable and highly efficient. Our team of experienced engineers enables us to construct high performance Agitators that are easy to assemble, commission, operate and manage. Owing to our advance facilities, W2P is able to manufacture a superior quality range of industrial Mixers that helps in mixing, homogenizing, gas dispersion and gentle stirring of low viscous & high viscous liquids. These precision designed and engineered agitators are extensively used basically in chemical, polymer, paint, chemical labs, pharma, construction chemicals, food, mineral industries etc. High Efficiency hydrofoil impellers to ensure better flow / mixing with minimum power consumption as that of traditional impellers. Wide spanning range of impellers enabling to select the optimum element for each individual application. Sweep Dia 0.5 Mtr. to 3.5 Mtr. The W2P-SM line, Standard Mixers, is designed for economical mixing solutions, available with short deliveries. It has a broad range of applications, including water treatment, fine chemicals and end-products industries. 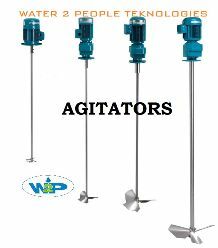 W2P manufactures specially designed anchor type agitators. These Agitator are an important component for any reaction vessel. These are generally slow speed type of agitator but we are also capable to provide these in customized specifications to our clients. The AGI-MD line, including three standard mixers, is designed for economical mixing solutions, available with short deliveries. It has a broad range of applications, including water treatment, fine chemicals and endproducts industries. Open and Sealed tank up to 250 m .